Buffalo, NY (March 27, 2019) – Police and emergency medical crews were promptly dispatched to the scene of an accident that occurred along the intersection of Delaware Avenue and Utica Street on Wednesday morning, March 27th. According to police, the crash involved one vehicle that crashed into a bus shelter at the aforementioned intersection at an unspecified time. Emergency responders stated that the crash happened after a minivan struck two trees and a light pole in the area, ultimately coming to rest only after crashing into a bus shelter. Medical crews who arrived at the scene confirmed that at least one person, the driver of the minivan, who has only been identified as a female, suffered injuries in the accident. That victim was immediately transported to a local hospital. At this time, the details surrounding the events that led to the crash are unclear and currently being investigated. Additionally, it is also unclear as to whether or not anyone else suffered any injuries in the accident. Before anything else, we would first like to extend our sincere sympathies to the victim or victims of this accident, as we preserve hope for their full recoveries. 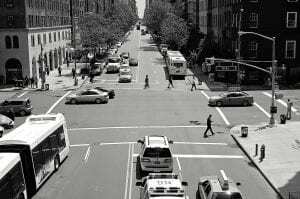 Following a New York car accident, it is important to understand that, as a victim, you may have substantial rights moving forward. At Hach & Rose, our New York accident attorneys have devoted their lives to helping victims and their families as we hold negligent and criminal drivers liable for the pain that they cause. We recognize the immense physical, emotional, and financial hindrances that often arise in the aftermath of a sudden accident, and we are here for you 24/7. If you have suffered an injury in a motor vehicle crash due to the reckless or criminal actions of another party, please don’t hesitate to call 212-779-0057 today.